The stunning upset by Cuban-American Ryan Lochte over Michael Phelps on July 28, 2012, at the London Olympics set me to wondering how their charts differed at the time of the event. 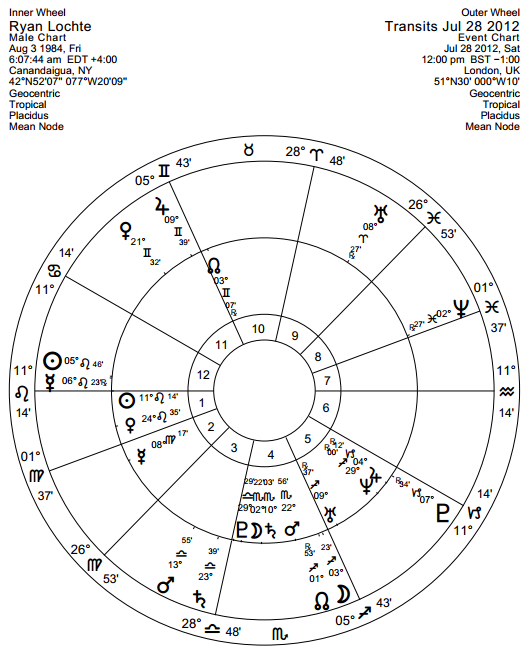 I could not find birth times for either athlete, so I cast sunrise charts and placed the Noon transits for Saturday, July 28, in London around the outside. Here are the charts with some comments. Lochte wins! Transits for Noon July 28 on outside. 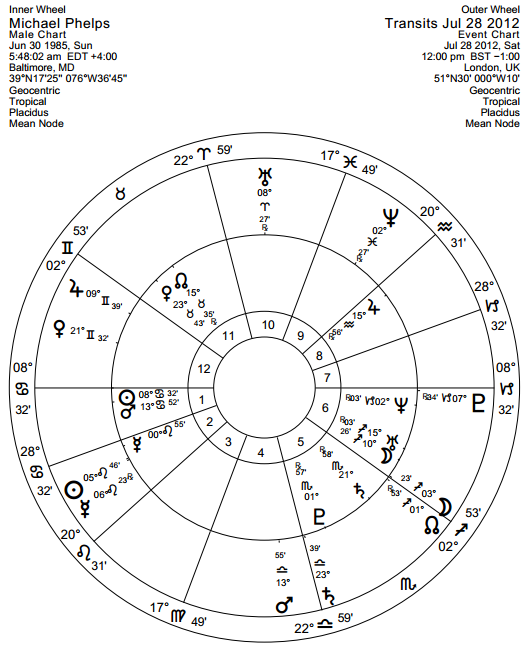 Lochte’s Sun at 11 Leo 14 receives sextiles from transiting Jupiter in Gemini and Mars in Libra. Transiting Jupiter trines transiting Mars. Solar Fire interprets this trine as: “You are enthusiastic with an endless source of energy. You could direct your energy to achievement in sports, politics or travel.” This transiting trine favorably aspects Lochte’s Sun through the two sextiles already mentioned. In addition, transiting Uranus (the planet of upsets) trines Lochte’s Sun from Aries. This transit repeats and “activates” the favorable trine from natal Uranus in Sagittarius to his natal Sun in Leo. Phelps loses! Transits for Noon July 28 on outside. Phelps has the same transits to contend with but they affect his Sun at 8 Cancer 32 quite differently. Transiting Uranus (the planet of disruptions) almost exactly squares Phelps’ sunrise Sun from 8 Aries 27 Rx. Solar Fire interprets transiting Uranus square natal Sun as: “Unusual and unexpected events and people may become part of your life during this transit causing you to feel on edge.” Transiting Mars, instead of favorably sextiling the natal Sun as in Lochte’s chart, forms a stressful square with Phelps’ Sun and almost exactly squares Phelps’ natal Mars as well. In addition, transiting Pluto closely opposes Phelps’ Sun, which Solar Fire interprets as “your ability to remain calm, assertive and compromising is being sorely tested” at this time. I deliberately quoted Solar Fire to show that I am not just pulling things out of the air to justify the interpretation of these charts. The stars clearly favored Lochte’s natal Sun on July 28th and put a monkey wrench in the works for Michael Phelps. Addendum: Astrologer Carolyn Egan also noted on Facebook that Phelps’s PMD (progressed Moon declination) is entering the south maximum turning point. This entry was posted in Astrology. Bookmark the permalink.